Samsung is further narrowing the gap between mobile devices and PCs thanks to today's announcement that it will begin producing the world's first 4GB LPDDR3 mobile DRAM. The memory, comparable to that of a desktop computer, not only trumps the company's 2GB LPDDR3 mobile RAM unveiled seven months ago, but reduces the size from 30nm to 20nm. "Our 20nm-class 4GB mobile DRAM provides another example of our ability to deliver well-differentiated, high-performance, high-density memory to customers in a timely manner," said Samsung Executive Vice President Young-Hyun Jun in a press release. "By providing the most efficient next-generation mobile memory with a very large data capacity, we are now enabling OEMs to introduce even more innovative designs in the marketplace." The 20nm-class process technology behind the 4GB LPDDR3 DRAM chips makes for a 30 percent improvement in performance and 20 percent savings in power consumption over LPDDR2 DRAM. It can transmit data up to 2,133 megabits per second (Mbps) per pin, which is more than double the performance of an 800Mbps LPDDR2 chip. "This makes it possible to transmit three full HD videos, collectively 17 GBs in length, in one second over the new Samsung chip embedded in a mobile device," claimed Samsung. The South Korean manufacturer's 2GB LPDDR3 mobile RAM announced seven months ago could run at a total of 12.8 Gbps and 1600 per pin. And that performance bested the single LPDDR2 chips in just 10 months. Samsung's announcement was coupled with hopes that this speedy new RAM will be an attractive solution for multimedia-intensive features on next-generation mobile devices. 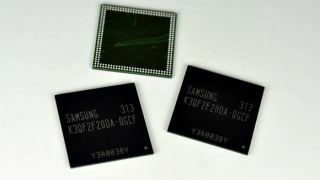 "We're focusing on LPDDR3 right now," Samsung Mobile Memory Group product marketing manager Stephen Lum to TechRadar. "That's really what's being adopted in the marketplace. Mobile users can start to get excited about the tech, too. "We're planning to roll this technology out into mass production into devices in the second half of this year," Lum said. "We're production ready. Our customers will be launching their devices over the course of the next couple of quarters." With smaller gadgets like Google Glass and more flexible technology like the rumored Apple iWatch on the horizon, the 20nm-class LPDDR3 could be a better fit for all sorts of mobile technology - eventually. "Last year, I think there was only a single device that launched with LPDDR3, so you're going to see a whole slew of new devices with the capabilities built around this technology," Lum told TechRadar. This means that Samsung's 20nm-class 4GB LPDDR3 memory should make its way into next-generation mobile devices over the next couple of months. The company's fast-paced memory division was able to put the 2GB LPDDR3 mobile RAM, announced last fall, into its Galaxy S4 smartphone, which launched this month. Samsung was reportedly also able to retain Apple as a chip-buying customer last fall, outfitting the iPhone 5 with 1GB LPDDR3 chips. However, there's no guarantee that Apple will use the South Korean manufacturer's newer LPDDR3 chips in the iPhone 5S or iPhone 6. Apple reportedly wants to ditch all of its Samsung-marked components. This includes swapping Samsung parts for Intel processors like the A7 system-on-a-chip. With industry-first announcements from the Smasung every seven to ten months, it's going to be a difficult task for any company to avoid using the world's largest memory manufacturer.